Raise your hand if you remember film cameras. I don’t remember when or how this lens developed that extra bend. I enjoyed experimenting with and comparing different brands of film. During Comet Hale-Bopp’s reign in 1997 for a few months, I did side-by-side comparisons of the comet taken from the same vantage point. As I recall, my preference back then turned out to be the old Fujifilm 35mm. Getting the exposure duration was tricky, and my then elementary-school-age daughter came up with a system of counting out loud one hippopotamus, two hippopotamus, three… etc. For sentimental Great Blue Heron reasons, this Fledgling is one of my favorites taken with that now-broken lens and film camera. It is NOT art by any stretch. What I like most about this photo are the colors of the Heron’s feathers. They seem to have a much broader, richer and nuanced range, and reveal a deeper depth of textures than any of my digital photos. Have you ever compared digital and film side-by-side? Do you have a preference, and why? Thanks to Cee for her CFFC: Tools. This camera and lens were stalwart companions for years. I had two of the same body, but two different lenses before going all digital in 2007. Thanks to Paula for her Thursdays Special: Pick a Word in October: Aperture . Due to an accodent, the ‘extra’ aperture of this lens let in much more light than normal. Thanks to Debbie for this week’s Travel with Intent Challenge – Six Word Saturday. I don’t think I’m capable of keeping the entire posy at six words, but at least the title is only six.. Thanks to Dawn for her Festival of Leaves: Week 7. This photo was taken when the upper end of the cove was still quite green, but the eastern end had glorious red maples blazing. Surprising how the microclimates in a small area can produce colorful leaves on differing schedules. If I Had My Life to Live Over: I Would Pick More Daisies, Sandra Martz, ed. 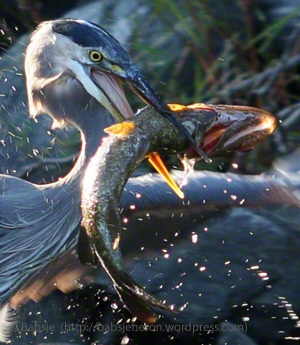 Great Blue Heron fishing as the waters descend. This week’s photo challenge is descent. This Great Blue Heron frequents these falling waters, fishing for the trout, bass, and pickerel in the pools at the base of the falls. Thanks to Cheri Lucas Rowlands and WordPress for this topic. Thanks again to Paula for hosting her wonderful Thursday’s Special non-challenge. Thanks also to Ailsa for hosting her wonderful Weekly Travel Theme: Autumn challenge. Thanks to the kind folks at Wordless Wednesday for the Wordless Wednesday challenge. Great Blue Heron’s exultant wings. This week’s photo challenge is dialogue. Thanks to Frederic B and WordPress for this topic. Why Have Wings at All? If not to touch the sky. Great blue heron silhouetted against threatening skies. This week’s photo challenge is silhouettes. Thanks to Cheri Lucas Rowlands and WordPress for this topic. Great blue heron takes aim at a passing dragonfly. Thanks to Michelle W and WordPress for their Weekly Photo Challenge: Contrasts. When last we saw this female heron, her prey was a hapless chipmunk. Earlier, she took aim at this dragonfly. Given the contrast in size of the heron and dragonfly, I wonder how many insects it would take to make a nourishing snack? Herons must consider dragonflies tasty morsels: the base of that waterfall is usually teeming with fish. Thanks again to Paula for her wonderful Thursday’s Special Non-Challenge challenge.